1. Experience the adrenaline rush of competition. So many of us have never felt what it was like to compete in sports during our youth. Maybe you weren’t the “athletic kid” growing up. Sure, you probably had plenty of extracurriculars­ like Knowledge Bowl, band, choir, speech… But the feeling of going head­-to-­head with your peers on a physical playing field is one that must be experienced firsthand. And what better place to step outside your comfort zone than within the familiar walls of No Excuses CrossFit? 2. Meet your fellow No Excuses CrossFit athletes. We all know this is so much more than just a gym. We get to know each other. We make friends. We cheer for each other by name. But what about the members on opposite schedules from yours? Get to know the early risers, the night owls, the weekend warriors. FNT is basically one big mixer, chock full of all the people with whom you share at least one very key interest. 3. Break through mental and physical barriers. Can’t do double unders? Never touched your toes to a bar before? Get ready to astound yourself. The Open has a way of drawing us out of our self­-imposed shells and showing us what we’re truly capable of. Plus, there’s no cherry picking at FNT. Those movements we may subconsciously­­ or not so subconsciously­­ avoid won’t be denied, and being forced to face them head on can open new doors for our fitness. 4. You’re signing up for 5 weeks of challenging yourself, proving your mettle, and having a blast! Not just WODs, FNT features teams, themes, entertainment, couch­bidding (sounds odd, but I can explain), and friendly rivalry for the Team Cup. There’s never a dull moment under the lights. 5. See your coaches walk the walk. Wish you could witness your favorite coach go hard in the WOD or pit yourself neck­-and-­neck against them? Maybe you want to return the favor for all the times they’ve barked encouragement in the midst of a particularly gross workout. Here’s your chance! 6. Because you’re good enough. 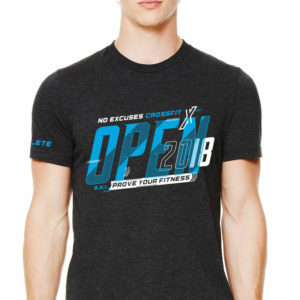 The beauty of the Open is that it truly is for everyone­­ especially now that there’s a Scaled Division. And trust me, the most thrilling moments of FNT are ones that live on vividly in our memories­­ belong to those who achieve their first pull up, double under, T2B, etc. 7. It just might inspire you­­ or you might inspire others. No matter which end of the fitness spectrum you currently find yourself on, I guarantee that if you show up and pour your all into the week’s WOD, people will notice. You may find yourself with your very own cheering section. FNT is further proof that we WANT each other to succeed, and that success is measured on a scale completely unique to each of us. 8. This is a journey, and we’re on it together. You work out with each other nearly every day. You’ve been there through the PRs, the benchmarks, even the setbacks. It’s only fitting to be there for each other now, even if you opt to take on the role of official spectator (by the way, hand­painted signs and personalized tees are always welcome!). Regardless of how long you’ve been CrossFitting or your (perceived) ability level, hopefully one of the reasons rings true for you, and you take it to heart when we say, “Yes, FNT is for everyone!” The magic that unfolds within No Excuses CrossFit walls must be experienced to be believed. Whatever your reasons, we sincerely hope you’ll be there with us as we carry on this awesome tradition of celebrating the community spirit which binds us together.